Social networks could one day revolutionize how we get shopping recommendations, but not yet. Instead, tablets are causing the biggest shakeup in ecommerce. 80.2% of 1000 holiday shoppers said no, personal connections on Facebook or another social networking site did not influence their shopping decisions. Other findings of Baynote‘s annual study include that 48.6% of tablet owners made a purchase through their big mobile device, and that email was the channel with the most useful promotions. Baynote’s entire 2011 holiday shopping survey of 1,000 shoppers between Cyber Monday and Christmas Eve (2.9% margin of error) is available in exchange for an email address. Baynote provides ecommerce personalization services to companies including Dell, AT&T, and StubHub. It’s technology compares a site visitor’s browsing patterns to those of other shoppers to power recommendations of relevant products to view next. [Update: I’d bet most people are at least subtly swayed by social networks in terms of what products they’re aware of and trust. Humans are not entirely accurate when reporting their own behavior in surveys. Respondents may have been subconsciously influenced when making product decisions. Amazon’s Price Check app recently stoked fears about “show rooming” — the practice of trying out a product in a brick & mortar store but then purchasing it online, which can hurt local merchants. 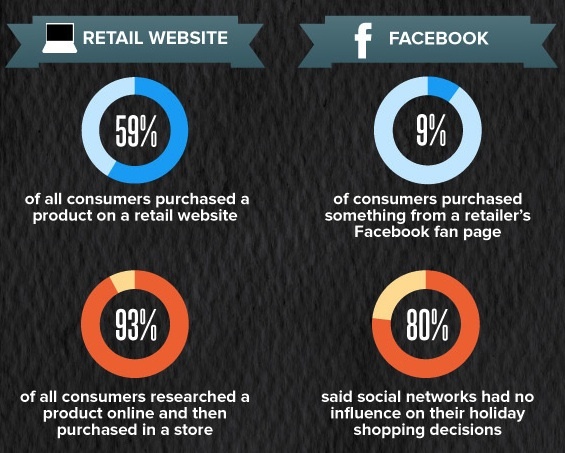 However, Baynote found the opposite is usually the case with 93% of surveyed consumers having researched a product online and then purchased in a physical store. Retailers on and offline that want to reach consumers with promotions should focus on email. 62.5% of respondents said email was the most useful way to receive promotions, trouncing direct mail (16.7%), search engine results (11.8%), and daily deals (4.9%). Only 2.5% said Facebook was the most useful promotion channel. This indicates there is plenty of room for innovation in social network delivery systems for promotions, such as Facebook Page tab apps, ads, and Sponsored Stories. The breakout success of this year’s holiday shopping season was the tablet. Half of tablet owners purchased using them, meaning 8% of all consumers are now tablet-based shoppers. Retailers should therefore be thinking about how to optimize for that screen size.